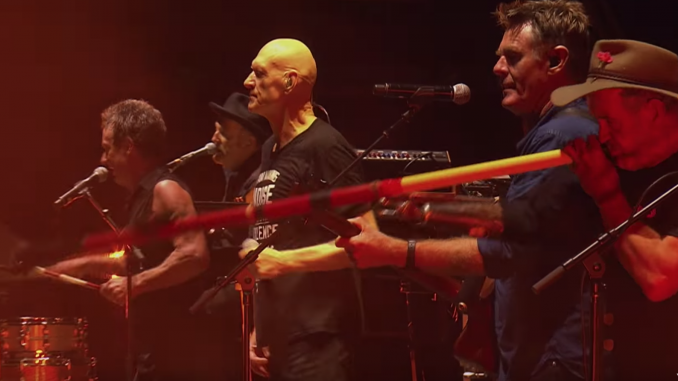 Midnight Oil have announced two intimate gigs for late May. These will be the Oils’ only Australian concerts for 2019 apart from their headlining appearance at the world’s most remote music festival, The Big Red Bash, near Birdsville on July 18. Tickets for the two warm up shows at Anita’s in Wollongong on Thursday 23 May andCanberra’s Royal Theatre on Monday 27 May will go on sale to members of Midnight Oil’s mailing list from 2pm AEST on Tuesday 9 April. Given the unusually small size of these venues they are expected to sell out quickly. A second batch will then be available to the general public from 10am on Friday 12 April. Strict anti-scalping measures will be in place for both dates and further ticketing information is detailed below. As always, fans are strongly advised to avoid using search engines like Google to find tickets as they steer buyers to unscrupulous and expensive overseas resellers. Instead fans should avoid getting ripped off by simply clicking the links to the official ticket agencies atmidnightoil.com/tour.